This is a very tasty and filling weekend breakfast. It does take some time for the potatoes to cook, but it’s worth it. The tomatoes are optional, but I really recommend them because they make a tangy sauce and also provide some liquid for the potatoes to cook in. To make this quicker, microwave-boil the potatoes before putting them in the skillet. Over medium to medium high heat, add some olive oil and sautee the onions and garlic for a couple of minutes. Add the thinly sliced potatoes and stir to get them coated in the olive oil, garlic, and onion, then add salt, pepper, cumin, and paprika to taste (i suggest to salt and pepper well, add dashes of the other two). Arrange the potatoes in as thin a layer as possible and let them cook for at least 5 minutes while you dice the tomato. Add the diced tomato, stir, arrange the potatoes in a single layer, and cover. Let it cook until the potatoes are soft. If they’re not cooking to the softness you want, add a little broth. When the potatoes are done, move them to the rim of the pan to make room in the center. crack two eggs in the center, then sprinkle the eggs with salt, pepper, cumin, and paprika. Cook to your desired done-nes. I like my eggs well done with a cooked yolk, so I flipped the eggs once. 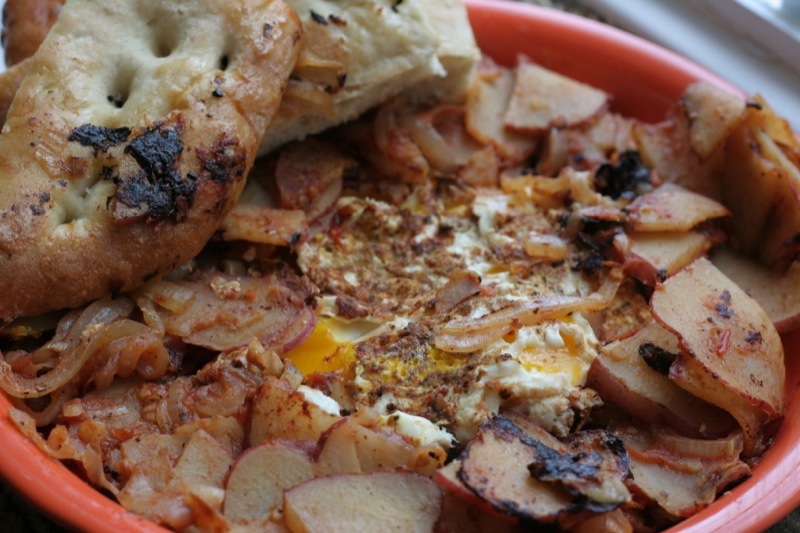 To serve, put the potatoes and onions in a rim around a plate, then put the eggs in the middle. Turn the heat in the pan on high and add a little bit of olive oil. Put in the bread and swirl it around the pan to toast, letting it pick up any juices or bits of onion left over in the pan. Serve with the eggs.